Trump executive order bans citizens, permanent residents and those who hold visas from Iraq, Syria, Iran, Libya, Somalia, Sudan and Yemen. In an Executive order, Trump has expressed the purpose of this decision to promote the security of the Mexican border as well as accelerate visa and citizenship determinations. Along with this , it is also intended to remove and deny illegal immigrants denied permission into the United States detain individuals suspected of violating Immigration laws. The purpose of this order is to secure public safety through the enforcement of immigration laws and through defunding sanctuary jurisdictions that do not comply with Federal Law. Sanctuary jurisdictions are locations in opposition to or who are questioning the governments approach towards immigrants. In this memorandum, the government will support manufacturing in the United States along with ensuring swift actions towards permitting and notifying of approvals for manufacturing agency expansion. In this memorandum, policy towards construction and operation of the DAPL are approved as a means of disseminating oil supply for the national market. In this memorandum, efforts by TransCanada to expand the pipeline through the United States are made permissible. This executive order is designed to increase projects designed to promote the national infrastructure as well as the federal infrastructure through actions such as repairing the economy and developing the United States interior infrastructure; bridges, pipelines, airports etc. 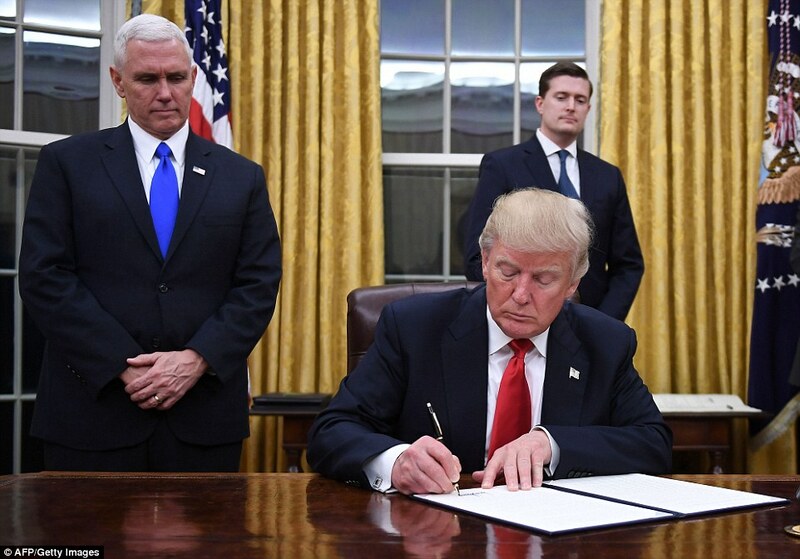 In this memorandum, the United States withdraws as a member of TPP negotiations and agreements.